Starting August 1, you can get this Howl-O-Ween Printer's tray kit absolutely FREE when you join my team! This kit is NOT available anywhere else! Isn't it adorable? I LOVE IT! 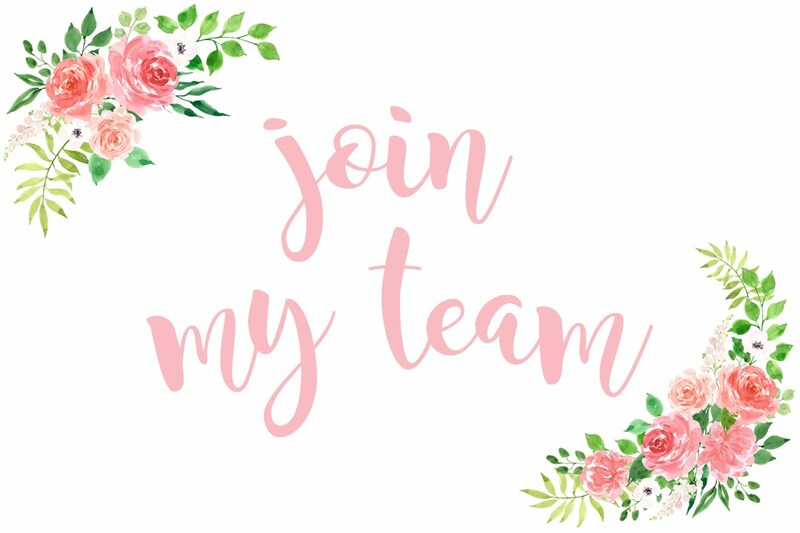 With the holidays rapidly approaching, now is a great time to join my team! The starter kit is only $99 and you get to choose up to $125 worth of product! The starter kit is COMPLETELY customizable so YOU pick the products that you want! 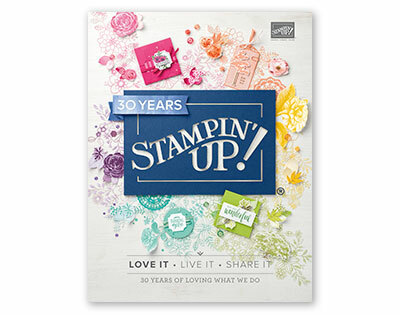 You will also receive a pack of Stampin' Up! business supplies to help you get started! There is no additional shipping charge for your kit! 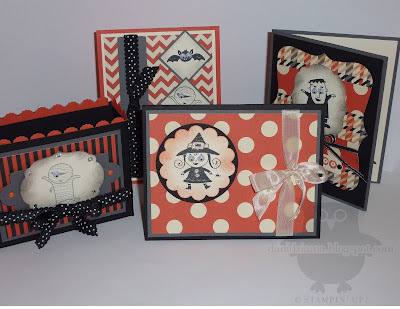 PLUS- you get the fabulous Halloween Printer's Tray kit absolutely FREE! Call me at (734) 497-8521 or email me and I'll be happy to answer any questions you might have! Tomorrow, July 31st, is your last chance to purchase the Reason to Smile stamp set. This beautiful set can be yours for just $5 with any $50 purchase. It's a limit of one per person. Get yours before it's too late! Here is a sample that I made with my set. Call me (734-497-8521) to place your order or visit my online store today (the link is in the right sidebar)! Hi and thanks for checking in! Hopefully everyone is enjoying their Sunday. Today I have a card that I was really unsure about when I started but think it ended up really cute! What do you get when you use Summer Starfruit, Island Indigo, Crumb Cake, Whisper White and some Birds of a Feather DSP? A simple yet very cute look! Good Evening! Friday's are my favorite day of the week! This week been a long week. Ok, so all the weeks are the same length but for some reason- this week seemed to drag on. 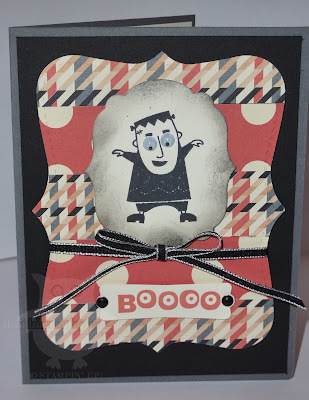 I didn't have a lot of stampin' time today but I have a quick card to share. I love that the cat is created by using a bunch of random Halloween themed words. Too cute! Good Evening! I wasn't very motivated today so all I have to show you is the rest of the box set we made at my "Come Stamp with me Tuesday's" class. On Tuesday, I showed you the box and one card. 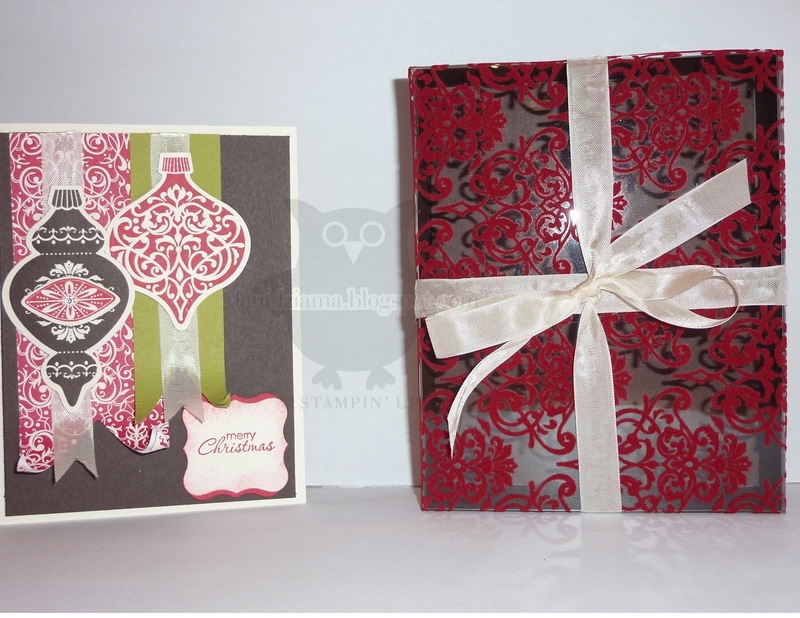 The complete set consists of a standard A2 box and three cards. All were very simple to make and didn't require much time to assemble. As for the A2 box- the trickiest part about that was the Flocked Window Sheet scoring/folding. I've not used Flocked Window Sheets very much so I wasn't sure if it would crack when I scored/folded it. Fortunately- the window sheets are actually rather durable and hold up nicely! No cracks at all! And they look BEAUTIFUL! I absolutely LOVE the color combination of Early Espresso, Lucky Limeade, Real Red, and Very Vanilla. WOW! I didn't want to wait this late to post BUT I've been busy! Tonight I created several projects however I am only going to show 2. I made a standard A2 card box to hold beautiful Christmas cards. This is one of the cards I made. I wasn't sure how I felt about it at first, but I really like it! I wanted to give you a heads up that today's Two-Fer Tuesday pictures will be posted this evening. 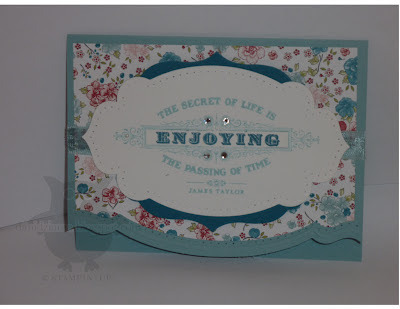 I will share what we made at the "Come Stamp with me Tuesaday's" class. I hope you are all having a wonderful day! Even though I don't have any stamping related pictures to share right now- I figured I'd leave you with this picture of random cuteness. 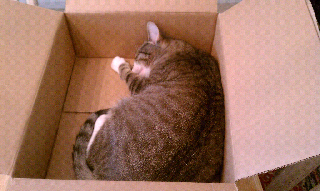 His name is Jake and he LOVES to sleep in my Stampin' Up! order boxes. Come Stamp with me Tuesdays! I would like to invite fellow Stampers in the Monroe, MI and surrounding area to come stamp with me every Tuesday at 6:30pm. 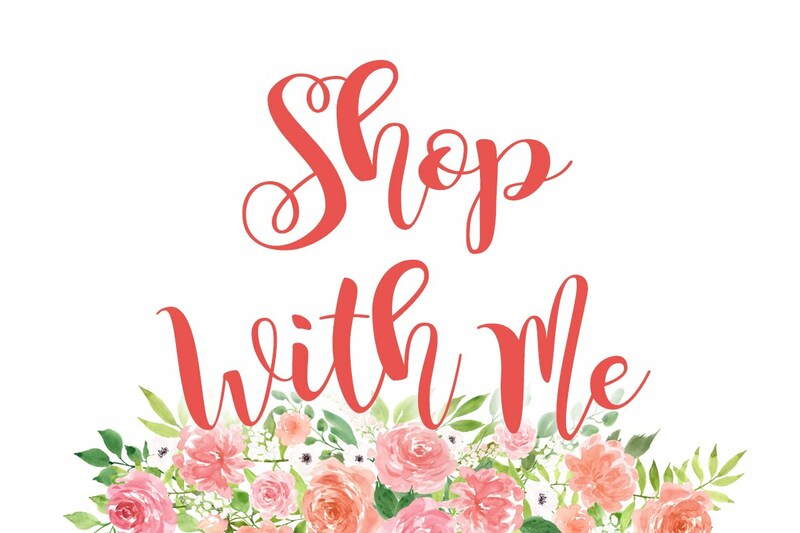 Come try out the new products, create cards and have FUN! Please EMAIL me if you would like to attend and I will send you my address! (The email me button is located on the right sidebar) Hope to see you there! Good Morning! Since the temps are going to be sneaking back up into the 90's tomorrow and several days next week, I figured I'd better get some house cleaning and other important stuff done. I prefer to spend my HOT days inside stamping! I have a Thank You card to show you today. It's made from a color combination that's bright and fun! 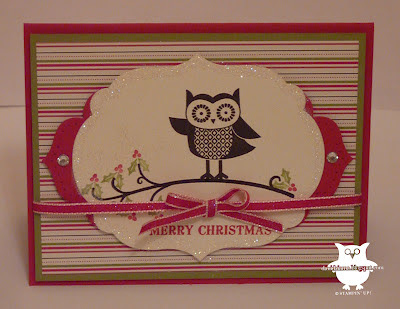 A few days ago, I shared a card that featured the Owl Occasions Stamp Set from the 2012 Holiday Catalog. 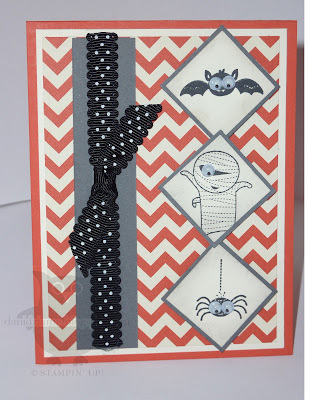 I had mentioned that it could be used for all occasions so today I have a card to share using the same stamp set but different card stock and embellishments. This time- I made a Birthday card. I apologize for the shadows. My photography skills aren't as good as I'd like them to be! 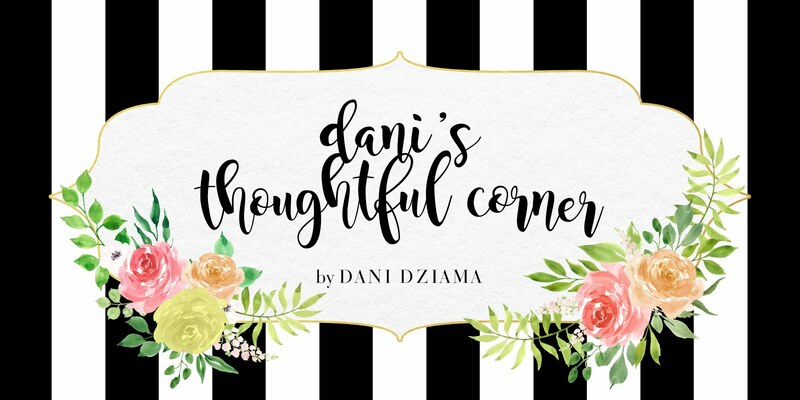 I figured that since I've been on a Halloween kick lately- today I would share something different! I chose to create a card that features one of my favorite sets from the upcoming 2012 Holiday Catalog. The stamp set is called Owl Occasions. I like this set because it really is for all occasions. Birthday, Christmas, etc... Plus- the owl is absolutely adorable! 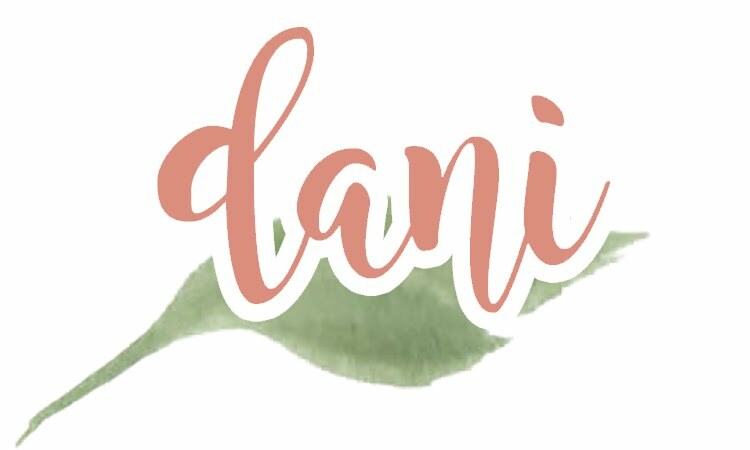 It was a quick card but I think it came out cute! Mini Milk Cartons!!! Aren't they adorable? Yes, they even open like a regular milk carton but these are kid-sized! What a cute way to package some treats. They are the perfect size for candy corn, M&M's, or any other small size candy . My favorite part about these is the fact that I can make multiple in a very small amount of time. They are made with the Big Shot, Mini Milk Carton Bigz L die, Sticky Strip, and your favorite card stock, DSP and embellishments. What exactly does that mean? It means that today I will update my blog and give you new ideas not once, but TWICE! It's extremely HOT in Michigan today (it's currently 97 degrees and the temperature is still rising!) so I figured I'd spend the day indoors making some cards, ornaments, and other fun projects to share with you. Good Evening! Tonight I have a Halloween project that I'd like to share. 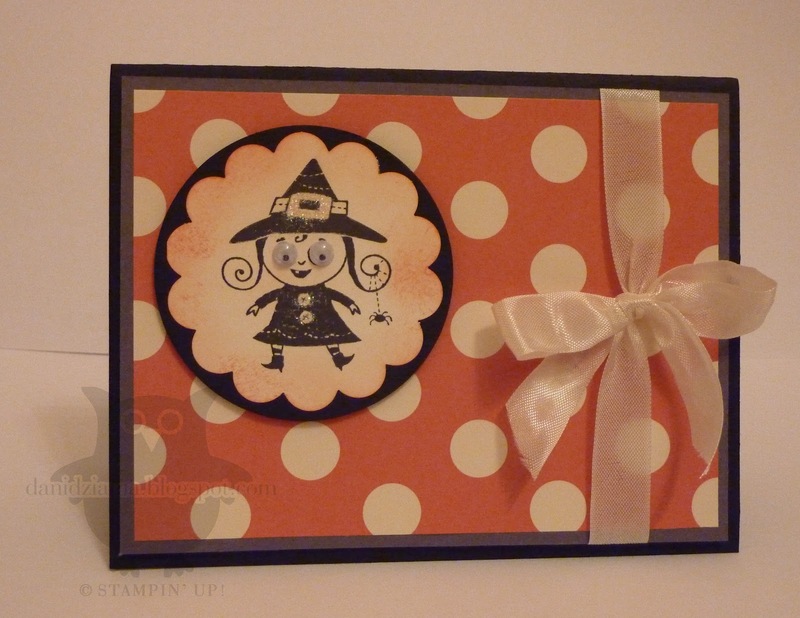 I made it using items from the new 2012 Holiday Catalog. I just love the Googly Ghouls set! This set is great because you can add little Googlie eyes to them. * Denotes items from the 2012 Holiday Catalog. These items will be available to order on August 1st. 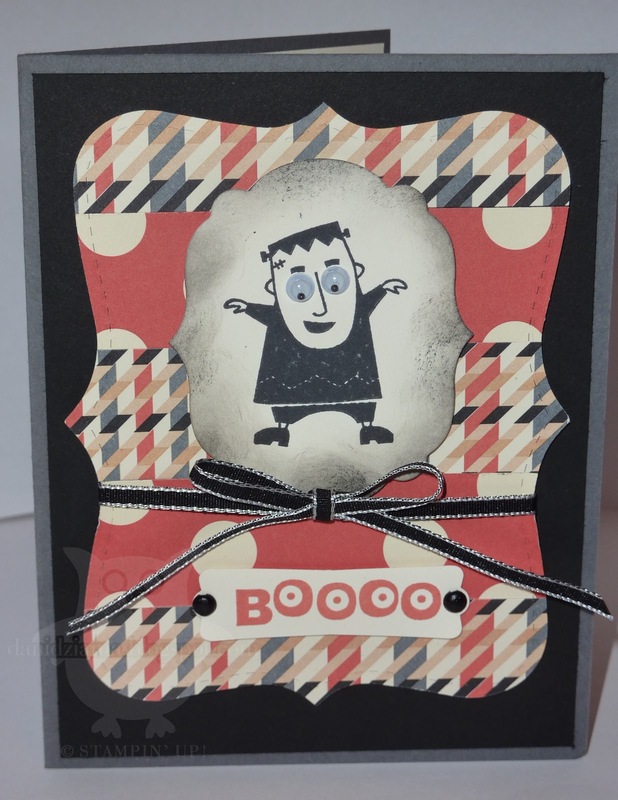 Yesterday, I promised to post a tutorial on how to create the Halloween Ornament shown below. This tutorial can also be used to create the Holiday Ornament or any other type of ornament that you would like to make. 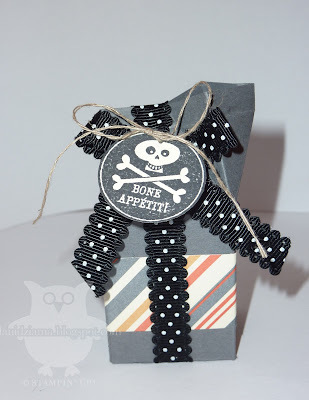 Just alter a few of the ingredients and your ornament will have a new look! * Denotes an item from the 2012 Holiday Catalog. These items will be available to order on August 1st. 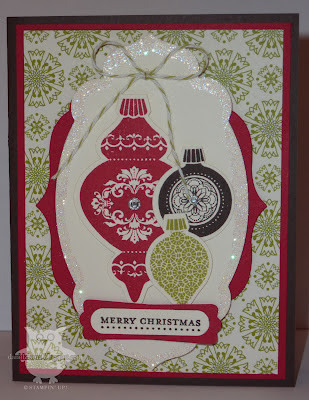 Stamp 20 of the large ornament in Basic Black ink onto Whisper White Cardstock. 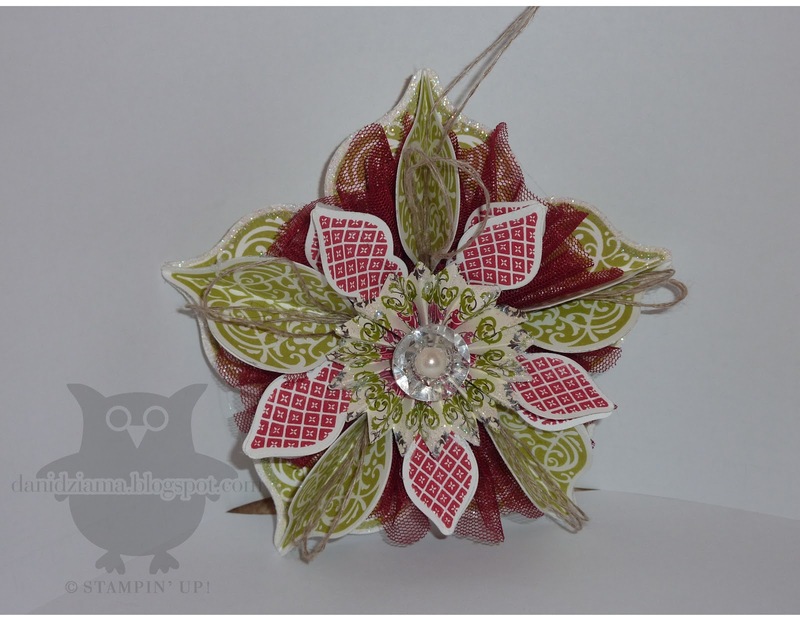 Stamp 20 of the smaller ornament in Tangerine Tango onto Whisper White Cardstock. Score 15 of the large Basic Black ornaments in half lengthwise using the Simply Scored Scoring Tool. Score all 20 of the small Tangerine Tango Ornaments in half lengthwise using the Simply Scored Scoring Tool. Use the Bone Folder to make the folds crisp. 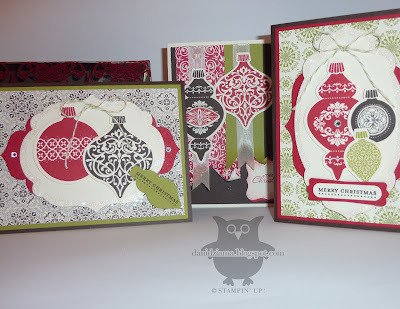 Take the remaining 5 stamped large Basic Black ornaments and turn them stamped side down. Using SNAIL, adhere the 3D large Basic Black ornaments to the unstamped side of the ornament. See picture above. 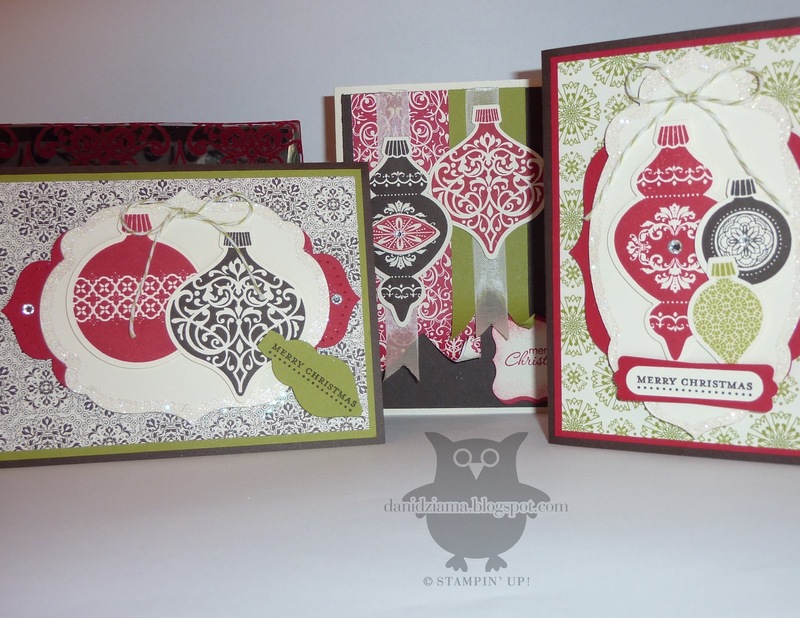 Take all 5 large Basic Black ornaments and the 5 smaller Tangerine Tango ornaments and outline the edges of all sides with the 2-way Glue Pen. Do this one ornament at a time. After all edges on the ornament have been outlined in glue- sprinkle the edges with Dazzling Diamonds. Set all ornaments aside and let dry. Cut a 3 1/2" circle out of Whisper White Cardstock and mark the center of the circle with a dot. The circle adds extra support to the ornament and the dot helps you center the large Basic Black ornaments on the circle. Cut five- 10" long pieces of Lucky Limeade Bakers Twine and set aside. Cut fifteen- 4" long pieces of 1/2" Striped Satin Ribbon. Apply a Glue Dot on the inside of the ribbon at the very bottom to secure the loop. 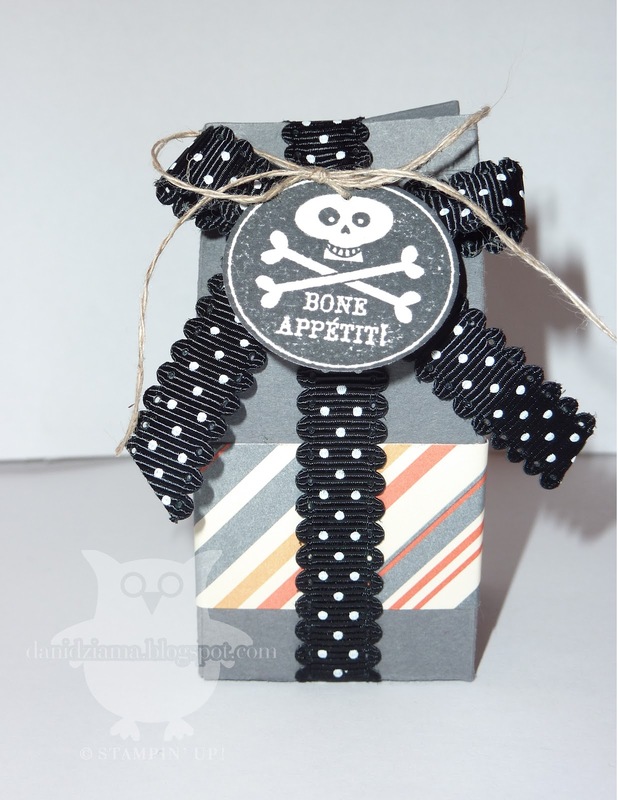 Make loops out of all 15 pieces of 1/2" Striped Satin Ribbon. Set ribbon loops aside. Adhere each large Basic Black ornament down one at a time using Sticky Strip- be sure to maintain the layout of the ornaments as shown in the picture above. Cut another 10" long piece of Lucky Limeade Bakers Twine. Make one loop and tie a knot at the bottom to secure the loop. This loop will be the hanger for the ornament. Adhere this loop using the hot glue gun onto the top large Basic Black ornament. Glue the knot of the loop as far down in the ornament as you can get it. Note: You may have to move the 2 loops that you glued in the last step to get a good location to glue this loop. Cut a 1" x 12" strip of Howlstooth & Scaringbone DSP. You can use whatever pattern you choose. I chose the pattern that was diagonal stripes on one side and Tangerine Tango with polka dots on the other side. 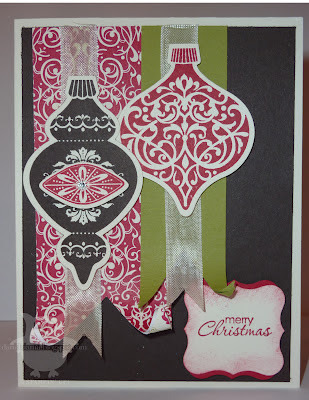 Using the Big Shot and the Designer Rosette Bigz XL Die, cut out a rosette. 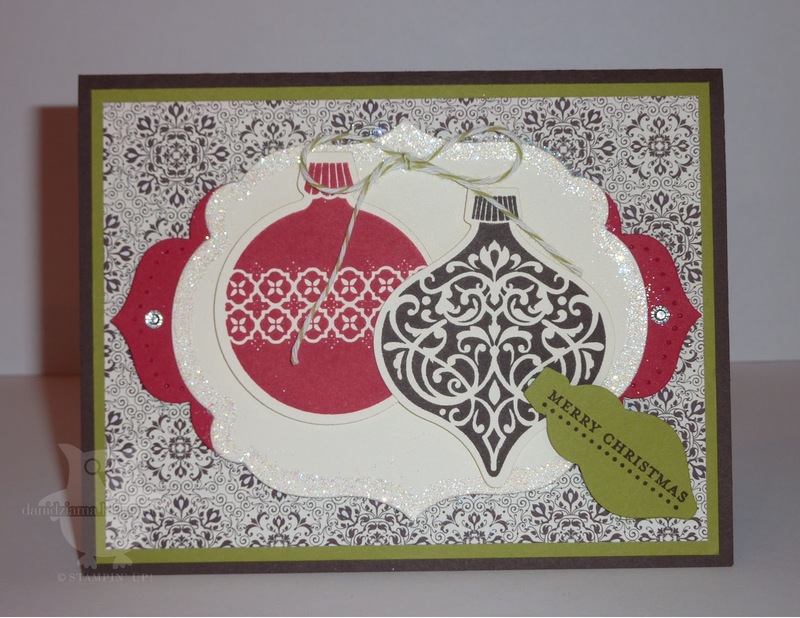 Use the 1 1/4" Circle Punch to punch a circle out of Whisper White Cardstock. After the rosette is cut out- assemble the rosette and attach it the 1 1/4" Whisper White circle with Sticky Strip. 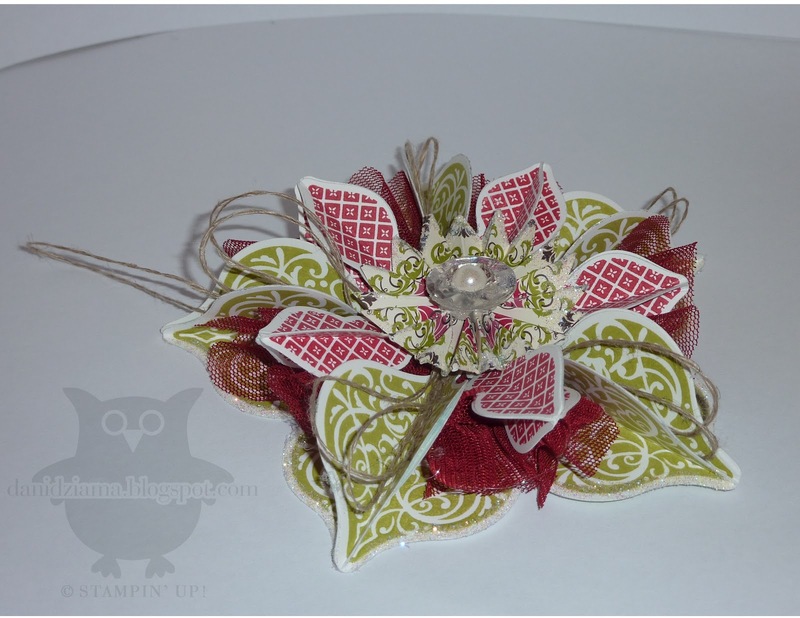 Take a Large Pearl Basics Jewel and attach it to a Stampin' Dimensional. 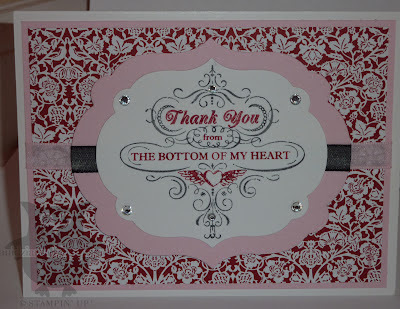 Trim excess Stampin' Dimensional from the Pearl with Paper Snips. Attach the Pearl to the inside of the Vintage Faceted Designer Button. Using the hot glue gun, make a pool of hot glue in the center of the ornament. It's OK to get glue on the tips of the small Tangerine Tango ornaments as this well help adhere the rosette to the ornament. Now you have your completed Halloween Ornament! Isn't it beautiful? I have another ornament to show you today. 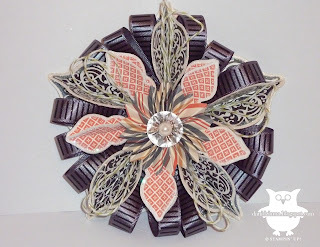 It's a different take on the Holiday Ornament that I posted yesterday. Since I'm a HUGE fan of Halloween- I thought it was only appropriate that I create an ornament for Halloween too! Yes, I will be posting instructions on how to create one of these. So keep checking back! Items marked with an * are items that are from the 2012 Holiday Catalog. These items will be available for order on August 1. If you don't have a catalog- contact me TODAY! 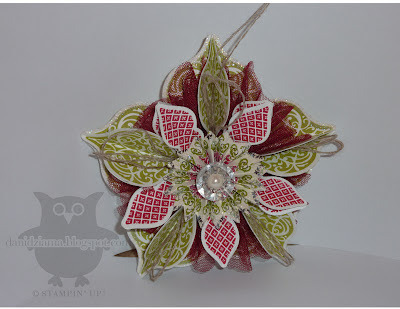 Today I'd like to share an ornament that I made from my Stampin' Up! Holiday Catalog preorder. I just got my supplies in this morning and I figured why not give it a try! I must admit that it looks a lot tougher to make than it actually is. Keep checking my blog- I plan to hold a workshop where we will create this beautiful ornament. It's the perfect gift for this upcoming holiday season! I have a card that I would like to share. It features the Postage Due stamp set from the Stampin' Up! Annual Catalog. Postage Due is one of my favorite sets because it is so versatile. 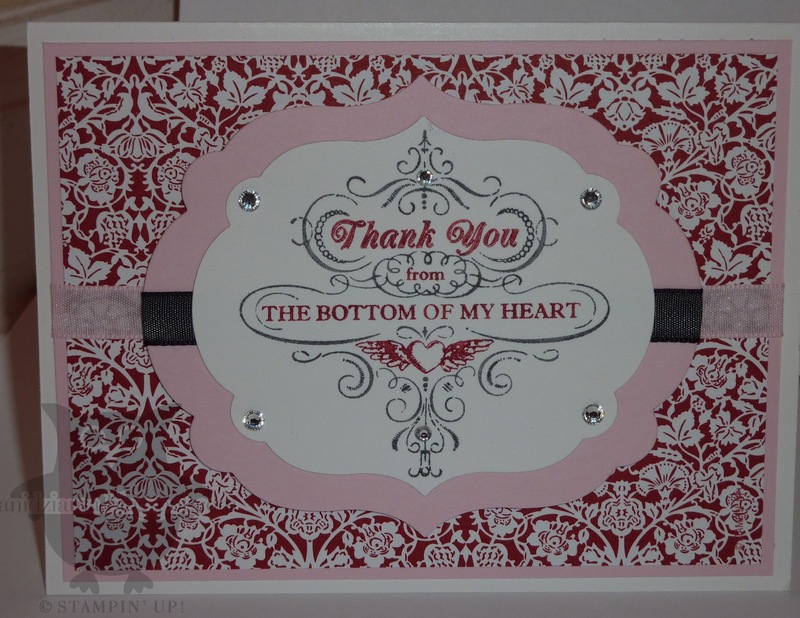 It can be used for a variety of occasions ranging from birthday's to thank you's and many many more. This card was created by using the Triple Time Stamping Technique featured by Dawn Olchefske.